What are Your Plans for the…Akhirah? As summer is fast approaching, almost everyone has been asking me if I have made plans for the summer. Yet, when I come across this ayah (verse) in the Qur’an, I ask myself whether I have really made any plans for my afterlife. Have I made plans for my death? Not at all! Sometimes, when Allah (سبحانه و تعالى) sends me reminders through natural disasters, deaths in the family, or through the Qur’an, I get so shaken up that I tell myself that I better get my priorities straight. 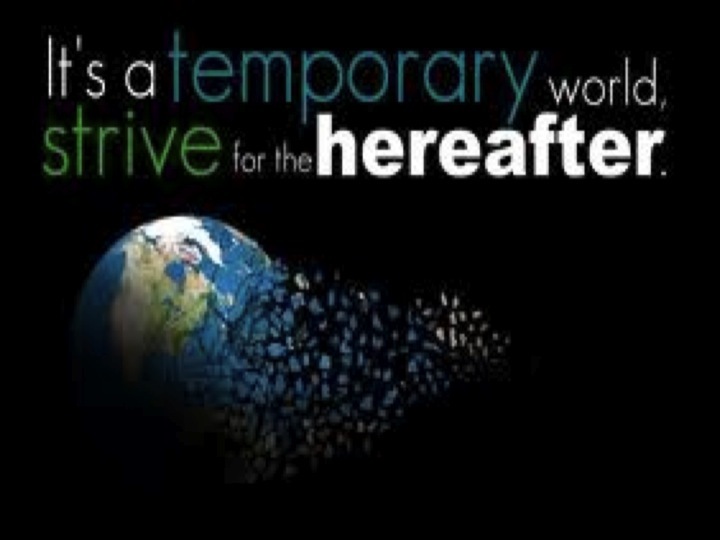 However, the impact remains for only a day or two, and then the Dunya (worldly life) intervenes. How many reminders will I need before I actually do start preparing for my death? Work at the level of excellence. Increase my level of patience. Am I prepared to meet my Lord today? It saddens me to say that, no, I am not prepared to meet my Lord today! I have so much to do before I can meet my Rabb. May Allah (سبحانه و تعالى) make it easy for me to prepare for my death; may He give me the ability to do such acts that would earn His pleasure, and prevent me from such actions that would cause His displeasure. Ameen! This entry was posted in Reflections and tagged akhira, death, Quran, Surah Al-Jumu'a. Bookmark the permalink. 2 Responses to What are Your Plans for the…Akhirah? A very useful post, short but powerful – Jkk Uzma! Something for each of us to think about – and more importantly, to act upon! Am I prepared to meet my Lord today? –>> Such an important question… I should ask myself that everyday, maybe it’ll help speed things up a bit, everything we constantly procrastinate!! This reflection was very important since it tells us about how we can prepare ourselves for the hereafter and that we should always seek Allah’s forgiveness if we commit a sin.